It’s that time of year again … back to school! While it can be exciting looking forward to a new school year, it can be a bit overwhelming too when it comes to getting organized. Hopefully by now you have all the supplies that were on your list, but either way, you know that it can be an uphill battle to keep everything sorted over the months ahead. Here’s the thing though … you have to stay organized if you want to be successful in school. It is the key to getting everything done on time and not having to expend any extra effort in doing so. That way you can earn higher marks and still get some free time to yourself every weekend. In case you can’t watch the video or just want an easy list to reference, I have typed out some of these tips and tricks out for you. 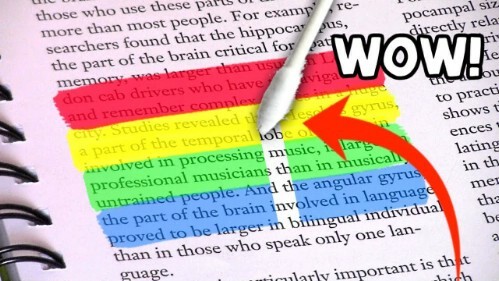 Check out these 35 genius hacks that will make your student life easy and stress-free! 1. Erase highlighter marks the easy way. 2. Erase pencil marks using your lunch. 3. 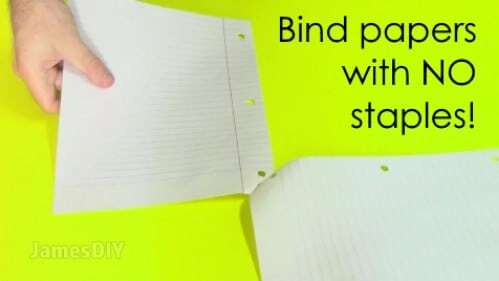 Attach your papers together without a stapler. 4. Use a mirror as a whiteboard. 5. Bring a hot dog to school in your thermos. 6. So much better than flashcards. 7. 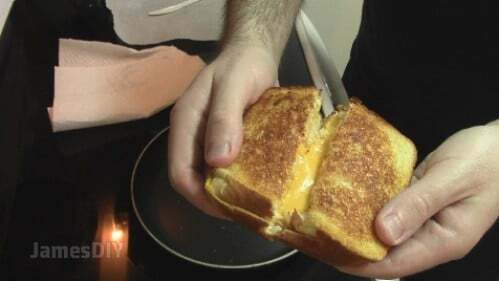 Make grilled cheese on parchment paper. Have a textbook which is riddled with distracting highlighter marks? You can magically remove them by dabbing a little lemon juice on a q-tip. Here’s a seriously bizarre one … say your pencil eraser runs out, and you really need to remove some pencil marks. Yeah, you could just ask the guy sitting in the desk next to yours to loan you one, but why do that when you can do something more creative? Tear a little bread off the sandwich in your lunch sack and use it to erase your pencil marks. Apparently bread was used to erase graphite before the rubber eraser was invented. I can’t count how many times I found myself needing to hand in a pile of papers without a stapler anywhere in sight. Well, you don’t need one with this handy trick. Grab a sharp knife or a pair of scissors and cut a small slot through the corner of your stack of papers (it needs to go through all of them). Then fold the corner of the stack over and through the slot. It is not the most secure solution, but it sure is better than just folding over the corner and hoping it holds. This is a great hack or your college dorm room. Why on earth did I buy a whiteboard when I could have just used my mirror? You probably stare at yourself every morning anyway to make sure that your hair is behaving, so you might as well also use your mirror to leave yourself helpful reminders, class notes, inspirational quotes, or so on. The only downside is that when you get a good look at your own face as you review your formulas before your calc exam, you may get a great view of just how freaked out you are about your test. The title here is pretty self-explanatory. 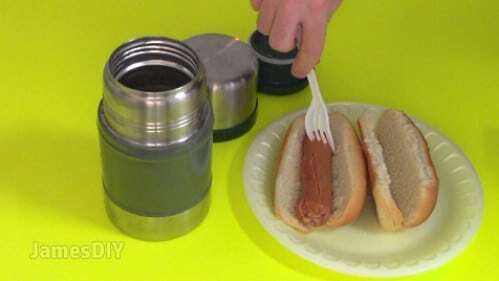 If you want to bring a hot dog to school for your lunch, a thermos is just the right size and shape container to use. 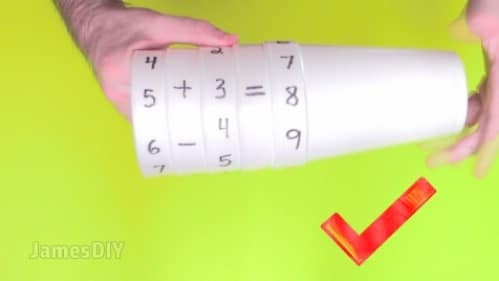 Okay, this may be one of the smartest ideas I have ever seen for teaching basic arithmetic. All you need are a few Styrofoam or paper cups. Put numbers around the rims of three of them, and operations on the others, and you can practice equations endlessly. No need for flashcards! Before you cook up a grilled cheese sandwich after school (because let’s face it—school lunches are deeply unsatisfying), line your frying pan with parchment paper and then cook on the lowest setting. Why? No dishes to clean up, and you can get right back to your homework. … And that’s just the beginning! Check out the video to learn more about these back-to-school hacks along with a whole bunch more—35 in total! Okay, so maybe there is no such thing as a school year which is totally stress-free. But the less stress you have, the better, right? These back-to-school hacks will save you time and money, and help you get more out of the supplies you’ve purchased. Be sure to share this post with your friends so they can also use these hacks to enjoy a smoother, more carefree school year, and good luck with this year’s academic adventure! Um…what ever you say internet!! I shall try!! Wait are there ways to get rid of bullies and also your first five years of life!? If so you can have the deed to my house in exchange for the hack! how did i get here its one am and i have school in the morning ._. Thanks so much for these havks! They were soo helpful! Your a lifesaver!